Before the conference, I spent some time exploring in both Virtual Hadrian’s Villa and Virtual Middletown, despite some technical challenges in running the platforms and plugins required on my laptop. These worlds are beautifully-designed and I want to commend you all for the artistic design. For those of you in the audience who may not know, the technology has existed for decades to create 360-views and 3D models. Those haven’t been widely incorporated into humanities work, or even in museums. This work is more prevalent in the design, architecture, and archaeology fields, and yet we are still far from wide adoption. The Smithsonian Institution recently revealed a new 3D initiative that took a few years to pull together. Even with the variety of collection and enthusiasm from its staff, they still were only able to release 12 objects that were scanned, rendered, and interpreted. Much time and effort was invested in making the design accessible and user experience understandable to those outside of the project teams who never worked with immersive environments. Building in WebGL is an accessible platform that does not require users to download external plugins or programs, and renders 3D graphics in a modern web browser. You can see in the web interface how Smithsonian staff framed each object in a broader context so that while the main goal of this initiative is to promote close reading of objects, users do not miss the bigger story of how the item functioned in the world. The work engaged in from the teams of Hadrian’s Villa and Virtual Middletown was also time-consuming and these projects were not small in scope. Deciding to build 3D environments is not a lightly-made decision. Any team makes a big investment in time, labor, and money to plan, design, and build any virtual world projects. Both projects presented here are testing the usefulness of building these types of worlds to increase historical understanding of very specific places at specific points in time. Recreating places that once existed can be fascinating explorations. Given that, I still have some big questions to ask about the argument, audience, user experience, and accessibility of these massive projects. I firmly believe in the concept that building, constructing, is a form of knowing and creating understanding. I see great value for the teams who built these environments to learn more about their construction, the environment, such as solar alignments, ways of reinforcing power structures, and how industrial design shapes the social and cultural history of a city. In architectural history or history of technology, these re-creations can serve as good places to observe and analyze the physical spaces, but how do these designs communicate an argument? What interpretation is made visible or pushed forward with these projects from the end users’ perspective? And how does this particular type of interaction encourage the development of historical thinking skills? I could not answer those questions from the time I spent visiting these virtual worlds. Both of these projects were designed with teaching in mind, but once created, where are the pedagogical cues and prompts to help users to understand how some of that knowledge has been constructed that the teams have internalized? I don’t mean that this needs to have lesson plans, but perhaps offer ways of modeling the type of activities of public historians or archaeologists engage in when researching: sourcing, comparison, while also asking questions of these places, these people. Who will be using these worlds beyond the scholars and how was the design tailored to their needs, expectations? Exploration of primary sources can be done in other ways, so how does a virtual world, such as Virtual Middletown, help us to better understand it if we are not helping to build it? 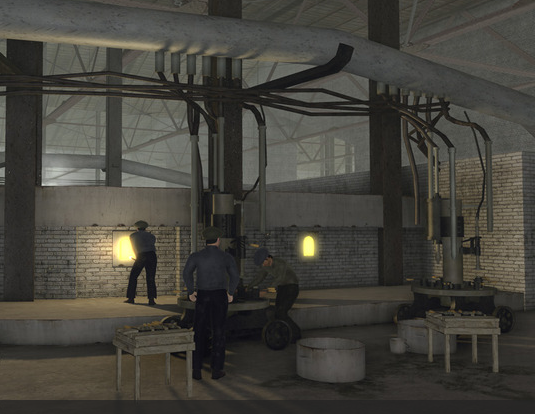 What else can be learned by maneuvering inside a re-created factory? That leads to my biggest outstanding concern, which is about user experience. User experience remains the biggest challenge with the use of virtual worlds for anything other than gaming. The interface leads, rather than the content. Personally, I still find it clunky. I’d also rather explore without the requirement that I choose and design an avatar where if I choose to be female, I walk around with one hand on my hip, swaying. My avatar was distracting me from my experience. Also, my avatar was like me visiting a living history museum since I’m dressed in a t-shirt and jeans. In Virtual Middletown, the Lynd’s study is all about people, working, doing, living. In the factory, it was surprisingly empty and relatively quiet. I did not learn much about the process of glass making or the individual workers. In Hadrian’s Villa the sounds of water and occasional flutes felt more serene, but I’m not sure if it enhanced my understanding of this place. Finding and browsing through the primary sources available in both worlds was difficult, and I found them to be very disconnected from the designed interface. For example, clicking on a statue in Hadrian’s Villa sent me to another site that contained an un-styled HTML table containing rows of metadata, unlabeled, which was a little shocking. I was taken away from the visual experience of the virtual world and I didn’t know what the metadata was exactly describing. One of the goals of Virtual Middletown was to build something immersive and not as anachronous as many living history sites. Well, this felt pretty anachronous to me. How accessible can these virtual spaces be to for individuals who are vision impaired? Downloading large extensions or new applications already creates a barrier for some with older machines, ones that they cannot update themselves, or to the growing numbers of individuals using handheld devices to access the web and digital content. Even I couldn’t get the virtual application to run on my laptop. It kept crashing, so looked at the web versions. There was a huge investment in money and labor to build these worlds and what hope is there that they will continue to be used in the next couple of years? If these projects are built on commercial gaming software that isn’t officially supported by the original designers then sustaining and continuing to build on the platform is problematic. Additionally, these are closed projects, and closed digital humanities projects are not likely to survive. Unlike the Smithsonian’s 3D data which is open, none of the data is available and the platform is not open for others to contribute. 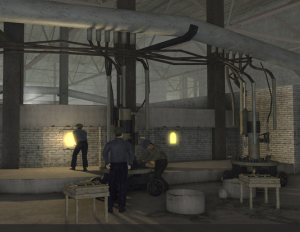 If the platform and the data were open, classes could recreate a structures and contribute those files back to the Virtual Middletown, for instance, and the project could continue to grow and the project manager could build a dedicated group of individuals invested in helping to maintain this site. It remains unclear to me what the sustainability plan is for these projects. Although I raised many questions about these projects, I appreciate the work done by these teams and the hours they have invested in exploring how virtual worlds can increase understanding of world heritage landmarks and historic places. And, I appreciate their willingness to share these projects here at the AHA. It is important to experiment with form and interpretation, particularly if we are interested in drawing in new audiences beyond our academic cohorts. I hope that additional user testing and some of the concerns mentioned earlier will be addressed in future versions of these projects. I look forward to following Virtual Middletown and Hadrians Villa into their next stages of development.